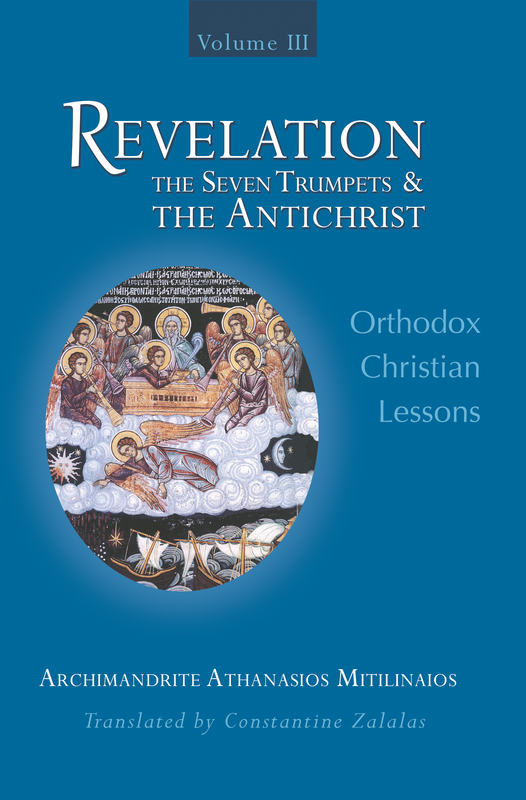 Revelation - The Seven Trumpets and the Antichrist is volume three in the series of the 104 homilies on the Book of the Revelation given by one of the most prominent Greek preachers, Archimandrite Athanasios Mitilinaios (1927-2006). The present volume covers chapter 8 through 13 of Revelation in lectures 37.5 through 57. Fr. Athanasios presents an in-depth yet easy to understand patristic interpretation of the Book of the Revelation touching upon the contemporary problems of our modern troubled life and offering spiritual answers and tested solutions from the nectar of our Orthodox Church. English. Translated and adapted from the Greek by Constantine Zalalas. Softcover. 6" x 9". 344 pp. Published by Zoe Press. $23 per copy, includes free shipping for Retail Orders in the Continental United States only.